A good friend of mine, crafts these amazing stadium blankets from recycled, team t-shirts. 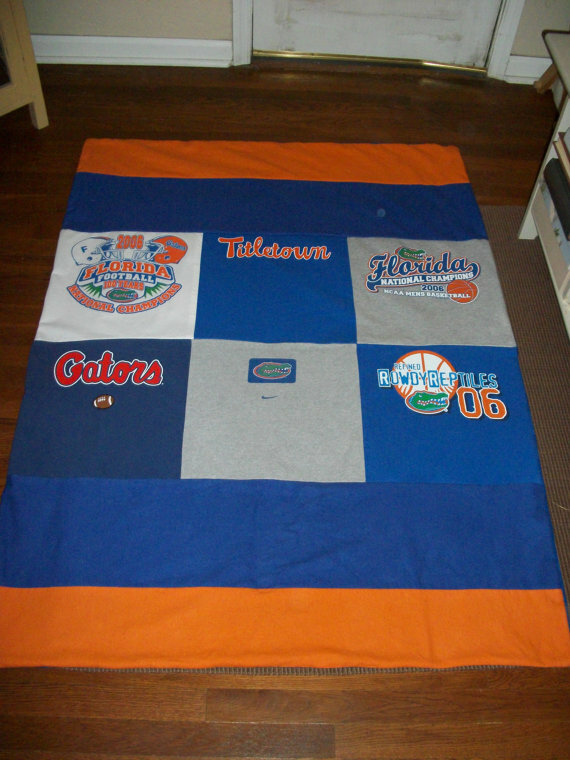 Reversible quilt featuring squares with t-shirts from your favorite school or colors. While the center is created with six t-shirt patches, the top and bottom feature flannel fabric in your colors. The other side features a fleece or flannel material for a super soft and warm throw blanket. Quilt measures 4 ft x 5 ft (48" x 60"). Great for family rooms, tailgating and dorm rooms for any sports fan! The quilt can also be made with up to 9 t-shirt squares from your teams tees or colors or with stripes as used in the fourth picture. The design, colors, and materials are all your choice.